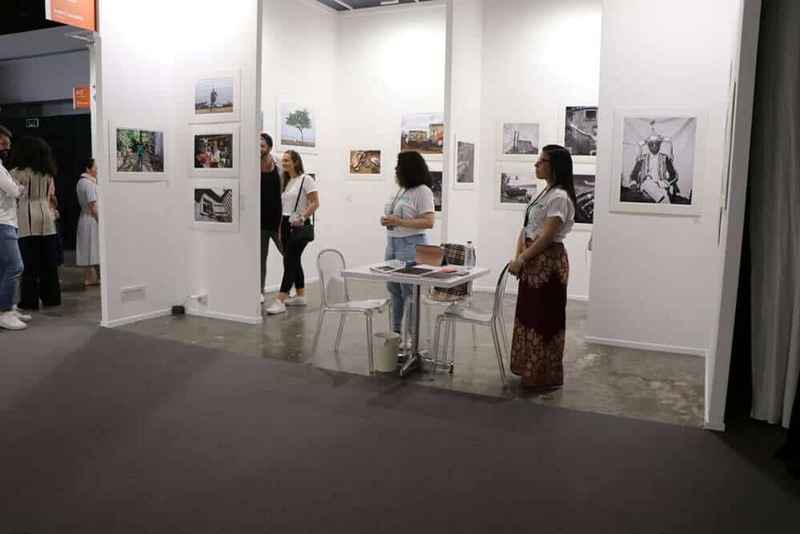 Brendon Bell-Roberts sat down with Art Dubai’s artistic director, Pablo del Val, to discuss this year’s focus on the Global South and how this relates to the trajectory of the fair over the past 12 years. This year sees a major thematic focus on the Global South. How has this approach been received in a city that is already well known for its multi-cultural make-up? This year’s focus on the Global South is true to the ethos of the fair and our focus over the past 12 years of Art Dubai. Art Dubai has always been the most globally representative art fair in the world. We have more than 92 galleries from 42 countries participating, each imparting unique energy not generally experienced at other global events. It is the cultural diversity in particular that distinguishes Art Dubai. This year has been the year to focus on the Global South – we wanted to make a further statement about our intentions to be the most representative fair in the world – not only because the Global South produces some of the most exciting art at the moment, but we also wanted to demonstrate that it is in the DNA of Art Dubai and encapsulated in the diversity of Dubai itself. 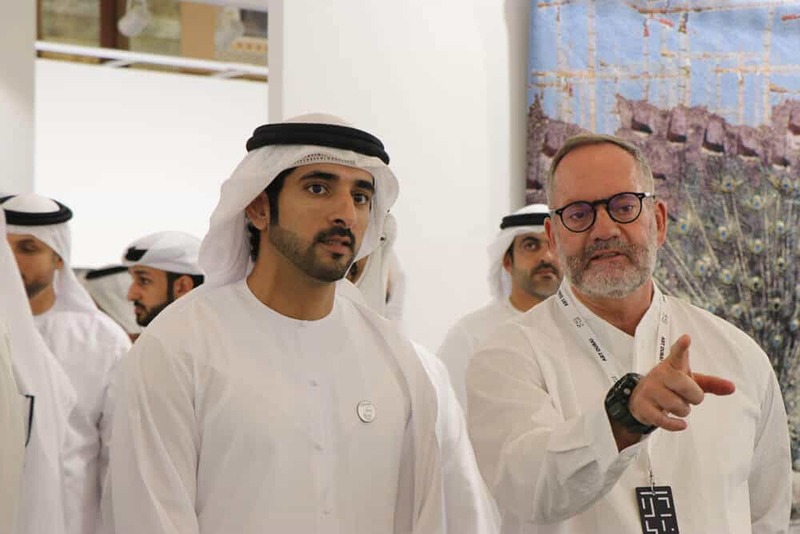 Sheikh Hamdan bin Mohammed bin Rashid Al Maktoum, Crown Prince of Dubai, United Arab Emirates and Pablo del Val, artistic director, Art Dubai view the galleries as part of the official opening of Art Dubai 2019. Image courtesy of Brendon Bell-Roberts. This focus is not be seen, or misinterpreted, as focussing on a trend. Art Dubai’s geographical location is an important factor that contributes greatly to the multi-cultural make-up of the art fair. The city is, and always has been, a crossroads of cultures and traditions – and a central point for accessing all the continents. Historically Dubai has been a central trading point for South Asia and Africa, so the city has always been a melting pot of cultures. The neighbouring emirate of Sharjah too has a long history of cultural links to Africa and is developing multiple projects through the Sharjah Foundation, which further illustrates the regions multi-culturalism. How has Art Dubai engaged with Africa over the years? Curator Bisi Silva has been fundamental to the development of Art Dubai, as an advisor and committee member, for a number of years. She was fantastic and enlightened us about what was going on in Africa helping to create the road for Art Dubai to be more engaged with the continent. Bisi was the curator of Art Dubai’s Marker 2013 programme, which focussed on West Africa. This was the catalyst for creating links between the continent and Art Dubai. Losing her is a great loss for the continent and we will miss her dearly. How have you positioned these new artists and galleries from the Global South in the fair? An important consideration was not to exhibit the artists and galleries from these regions as ‘exotic’ but as legitimate participants in the international art world. At Art Dubai, all our participating galleries and artists are presented on an equal footing. Perve Galerie’s booth showcased work by photographer José Chambel. Image courtesy of Brendon Bell-Roberts. 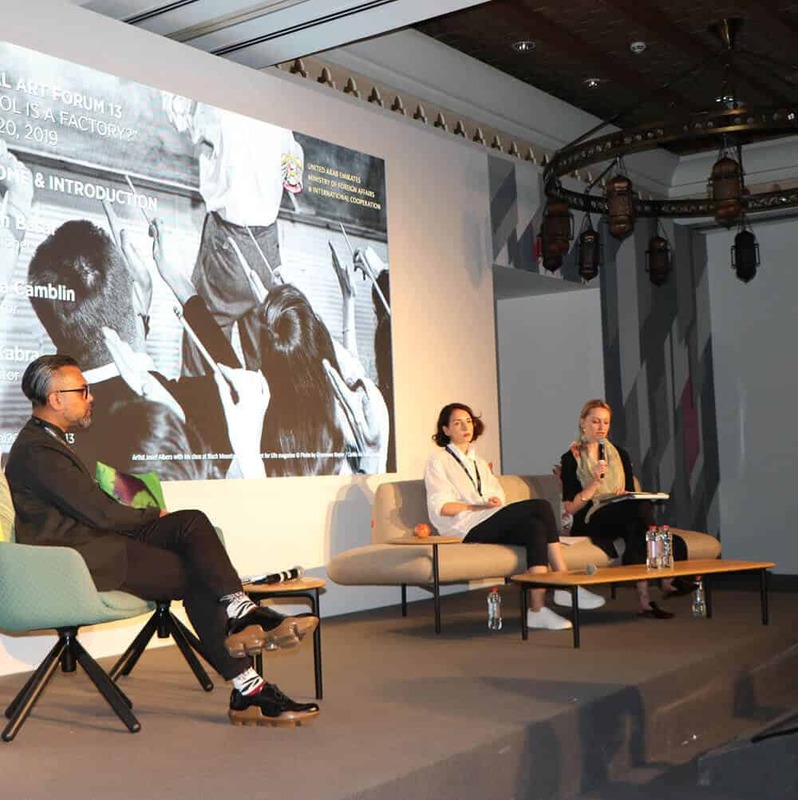 Global Art Forum was organised by Commissioner Shumon Basar, with Editor and Writer Victoria Camblin, and Curator and Writer Fawz Kabraas Co-Directors. Image courtesy of Brendon Bell-Roberts. Do you see any similarities or differences in the production and content of the work from these new regions to the work from the more established markets? Many of the themes you encounter this year at Art Dubai are shared around diaspora, migration, and displacement. The intention was to present programming that represents the 5% and not the usual euro-centric or North American focussed work. We wanted to share different ways of approaching art, of thinking about art – and present different aesthetics, approaches, and realities. For the collectors that come from Europe or the West, and who aren’t familiar with this type of work, it has been extremely rewarding for them. Some of them don’t understand the work and some of them do – but generally, it has been a great success for the galleries from the Global South, so far. What has the feedback from collectors been like? As far as collectors are concerned you definitely have the different types. Firstly there are those that are new to collecting art from the Global South, but have done lots of research on the region. Secondly, there are those who collect what they are used to. And, for the established market collectors will always have mixed responses – some are positive and some not so much. In the case of the Middle Eastern collectors, there is a strong aesthetic connection with African art. Many of the artworks that were brought to Dubai by the African galleries are acquired into local or Middle Eastern collections – they are less interested in the Western galleries that participate in the fair. 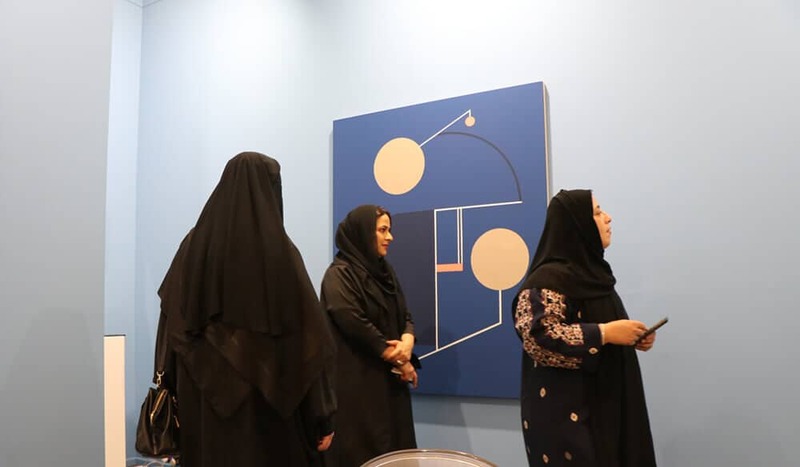 Hafez Gallery, Showcasing a work by Ali Chaaban, at Art Dubai Contemporary 2019. Image courtesy of Brendon Bell-Roberts. 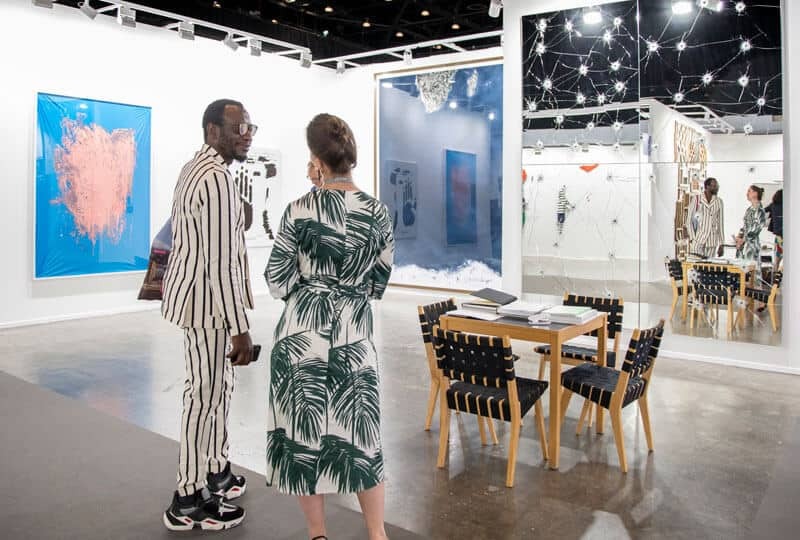 Azu Nwagbogu (left) at Sprueth Magers (Berlin, London and LA) at Art Dubai Contemporary, 2019. Courtesy of Photo Solutions. Can you elaborate a little bit more on the African representation at this year’s fair? This year the African galleries have been inactive and fruitful discussions with visiting curators and collectors of African art. Initially, we wanted to create a section that would focus on Africa, which we decided was the wrong approach. Instead, our intention is to start connecting curators, institutions, and galleries interested in African art – and help them build lasting relationships that are solid and meaningful. This starts by creating the right platforms for conversations between these curators, institutions, critics, and our participating Global South and African galleries. The intention is to do this slowly and properly. We need to educate our audiences so that we can represent and showcase African art from the continent, and not only from the diaspora. The diaspora is easy to engage with – convincing a gallery from New York or London to participate in Art Dubai is not difficult – but getting galleries from Africa to participate is far more challenging. It’s really important that the writers, critics, curators, and museum directors are engaged in these projects so they can grow global interest in the art from these emerging market regions. It is also important for the rest of Africa to also see what is happening in the international art world. This is where our residency programme works so well and soon we will focus the residency programme on Africa. There will be 12 African galleries each selecting 12 African artists who will be in residence for 1 to 2 months. For our Latin American residency programme, we approached galleries specifically from the Latin America regions. The idea was not to select international galleries that represent Latin American artists as we wanted to shine a focus on art practice from Latin America itself. We would want to highlight African artists and galleries so that those regions can benefit from the programme, international media exposure, and the experience of working and living in an international cultural hub. This approach encapsulates the vision we have for Art Dubai and the future of the region as a cultural powerhouse. By investing and focussing on these new market spaces that are sometimes operating on the fringe of the mainstream we hope to keep Art Dubai exciting and relevant for the next 12 years. Voice Gallery showcased work by Salvatore Emblema at Art Dubai Contemporary, 2019. Image courtesy of Brendon Bell-Roberts. 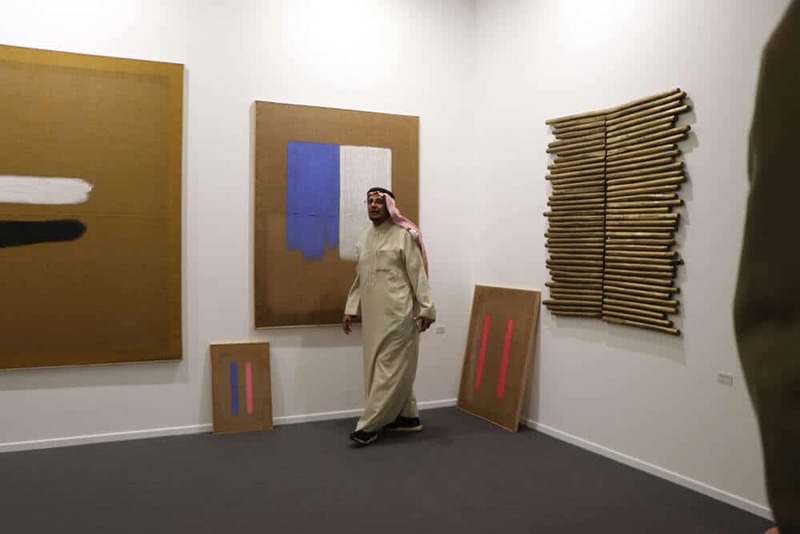 Aspan Gallery, Georgia, booth showcased work by Said Atabekov at Art Dubai Contemporary 2019. Image courtesy of Brendon Bell-Roberts. 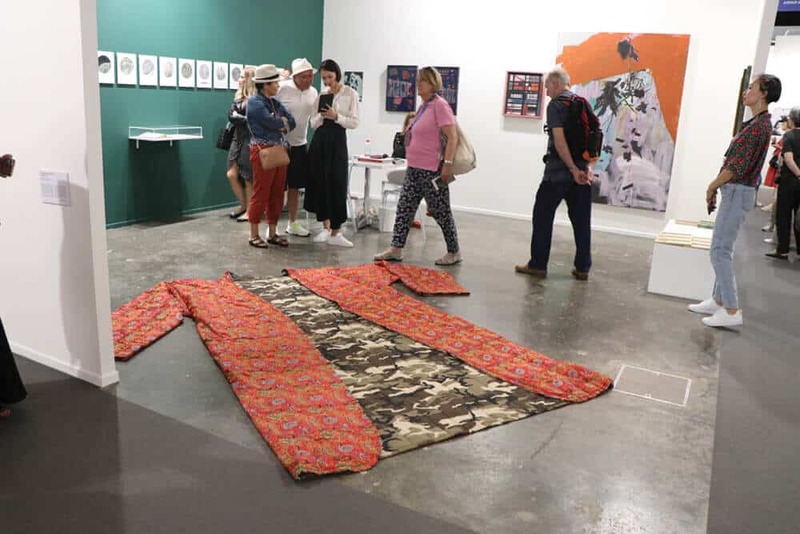 Kristin Hjeledgjerde booth, Art Dubai Contemporary 2019. Image courtesy of Brendon Bell-Roberts. Art Dubai Modern 2019. Image courtesy of Brendon Bell-Roberts. 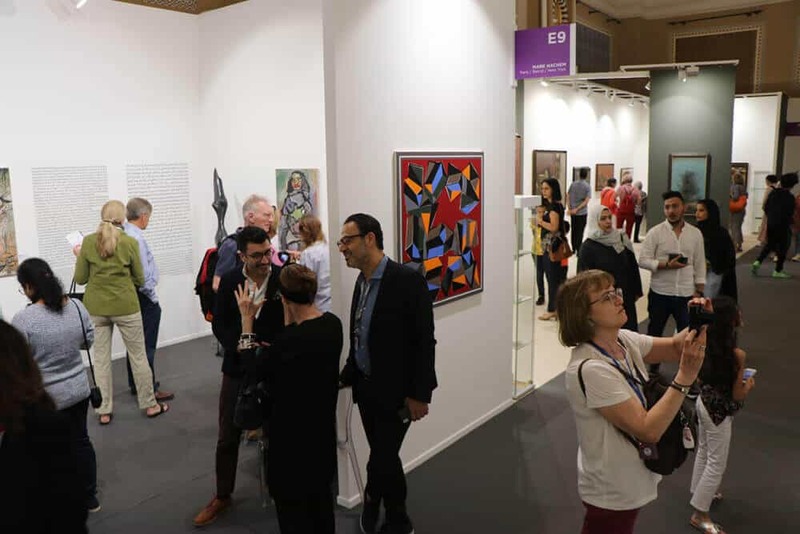 The most global and diverse of art fairs, Art Dubai 2019 showcased 92 galleries from 42 countries, displaying 500 artists from 80 nationalities across its four gallery sections: Art Dubai Contemporary, Art Dubai Modern, Bawwaba, Residents, Global Art Forum and Art Dubai Modern Symposium. Art Dubai will return to Madinat Jumeirah from March 18-21, 2020. Art Week highlights the broad programme of cultural events taking place across Dubai and beyond each March, offering residents and visitors alike a packed programme of fairs and festivals, one-off happenings, special performances and installations. 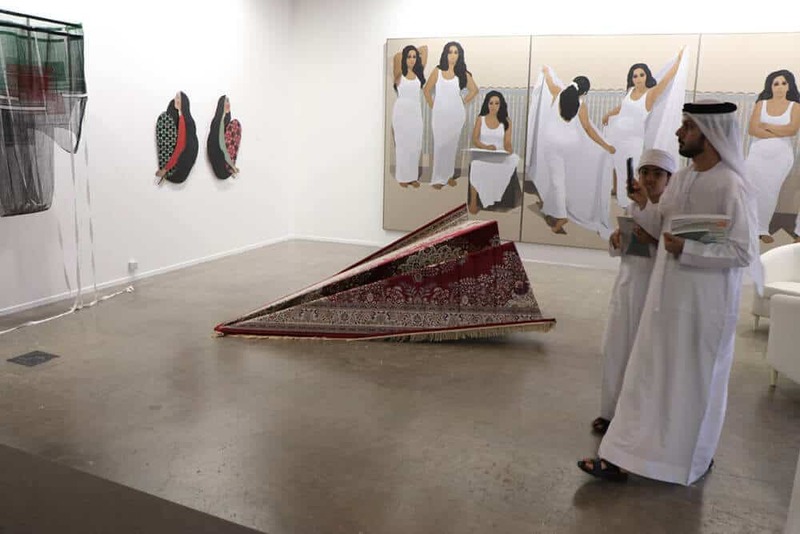 Spread over seven days, highlights include: the region’s leading art fair, Art Dubai; SIKKA Art Fair, held in the heart of Old Dubai; openings and special events in the city’s commercial gallery district of Alserkal Avenue, the newly-opened contemporary arts museum, Jameel Arts Centre, Louvre Abu Dhabi, the 16th Abu Dhabi Festival and the 14th Sharjah Biennial. Launched by the Art Dubai Group, with the support of the Dubai Culture & Arts Authority, Art Week aims to demonstrate the dynamism and progressive spirit of the city’s thriving cultural scene.